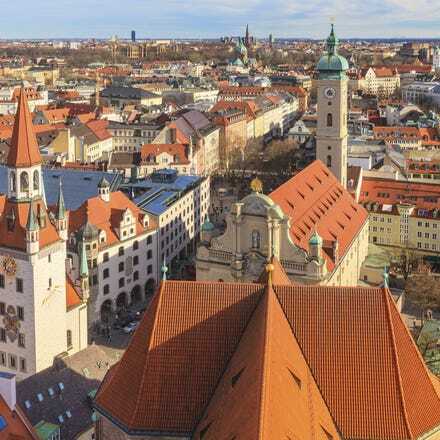 Munich is the capital of the state of Bavaria. Famous for it annual Oktoberfest celebration and its beer halls, the city is also home to centuries-old buildings and numerous museums. It's a city that won't disappoint and will leave you in no doubt about its reputation as as one of Germany's most sophisticated and refined cities. Catch a cheap flight to Munich with Aer Lingus and enjoy a quick and comfortable journey. We operate daily departures to Munich from Dublin Airport Terminal 2. Once you reach Munich airport, the city centre is just a few minutes away. In Munich exclusive shopping, fashionable streets and monumental buildings co-exist with Lederhosen, brass music and rustic beer halls. Visitors can start their day in a simple bar with knuckle of pork and sauerkraut, and end it in a gourmet temple with white linen tablecloths. Moreover, Germany's most cheerful residents live here. There is a large network of underground, commuter trains and buses centred around Marienplatz and Karlsplatz/Stachus. It functions excellently in the inner city and is considerably easier than trying to get around by car. A day pass for the entire MVV network (Münchner Verkehrs- und Tarifverbund) costs € 11,20 and for the central city zone € 5,80 “Munich City Tour Card” for € 9,90 gives you reductions in some hotels, shops and museums and is valid as a ticket for unlimited travel in the inner city.